A greenhouse can help increase plant growth and fruit production and even allow you to grow plants that wouldn't normally survive in your climate. Understanding how the process works can help you to get the most out of your greenhouse. Plants need light, warm temperatures, air, water, and nutrients to survive and grow; different plants have different requirements for each of these necessities. A greenhouse works by providing the first two requirements for your plants, but the last three are up to you. 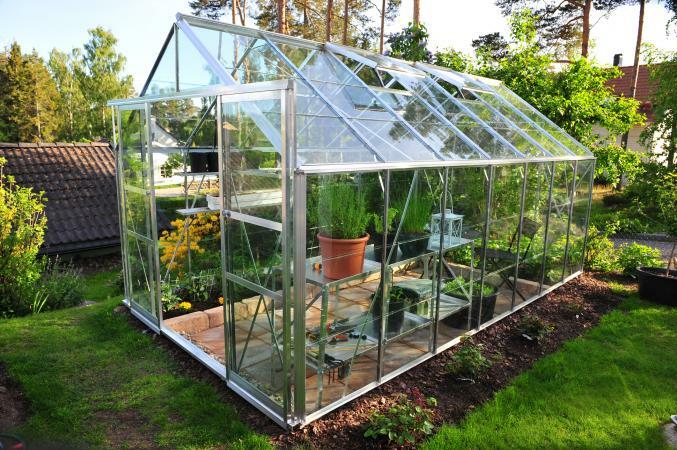 Greenhouses are made mostly of translucent materials, usually in the form of either glass or clear plastic. This gives the plants inside maximum access to sunlight, which they use for photosynthesis: combining carbon dioxide from the air and energy from sunlight to make simple sugars, which the plant then uses as food. On average, plants need about six hours of sunlight per day, although this varies depending on the type of plant; placing your greenhouse where it will get full sun all day will ensure that the plants inside get enough light. Greenhouses are warmer than the great outdoors because all that sunlight coming in through the clear glass or plastic walls turns into heat when it hits a solid surface, such as the ground or the plants inside the greenhouse. Light is really a form of energy, which is why plants can use it to fuel photosynthesis. When light hits a solid surface, the surface absorbs some of this energy, converting it to infrared energy (aka heat) in the process - the darker the surface, the more energy it can absorb and turn into heat. Infrared energy has a different "shape" than light energy - what scientists refer to as wavelength - so while light can easily pass though a greenhouse's glass walls, this heat takes longer to escape. The trapped heat warms the air inside the greenhouse and because a greenhouse is relatively air-tight, the warmer air stays inside, raising the entire building's temperature. This is the same effect that you've no doubt experienced when getting into a car after it's been sitting in a sunny parking space for a few hours. With sufficient sunlight, the temperature inside a greenhouse may become much higher than the outdoor temperature; in fact, on a hot sunny day you may need to ventilate the greenhouse all day to keep from literally cooking the plants inside. On overcast days, less sunlight means that the greenhouse will heat up more slowly, if at all. For that reason, greenhouses are most useful in areas that have plenty of sun. The plastic or glass that makes up most of a greenhouse's exterior is great for letting in the maximum amount of light, but it's a poor insulator; heat energy travels though it eventually to escape to the outside world. As long as the sun is shining this doesn't matter because light energy comes in faster than the heat can get out. At night, however, all that heat energy will quickly depart, leaving your plants at the mercy of lower nighttime temperatures. In order to protect your tender plants, you need either to store excess heat during the day or use an artificial heat source at night. Different materials take different amounts of energy to heat up, a characteristic known as thermal mass. The higher a material's density is, the more energy it takes to raise the temperature of that material. Thus, high-density materials such as stone, brick, concrete and even water can store a lot of heat energy. 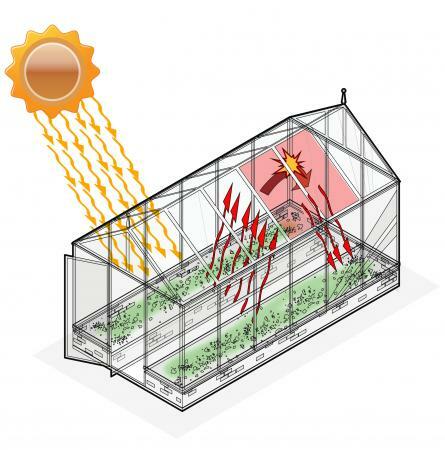 Adding these materials to your greenhouse means that it will take longer for the building to heat up during the day because heat energy gets trapped inside the high-density materials; however, during the night, all that extra heat energy will slowly be released into the air inside the greenhouse, keeping your plants warmer after the sun goes down. Some enterprising greenhouse owners multi-task by keeping large fish tanks inside their greenhouses: the water in the tank provides lots of thermal mass to store heat, the fish grow faster and are more productive thanks to the extra warmth, and the waste retrieved when cleaning out the fish tank makes excellent fertilizer for the greenhouse plants. If adding more thermal mass to the greenhouse isn't an option, you can always resort to putting in an artificial heat source such as a space heater. Ideally, you'd want a heat source that you can link to a thermostat so that it automatically keep the temperature inside within the desired range. Greenhouse supply stores carry many types of artificial heaters designed specifically for use in greenhouses. While greenhouses are highly efficient at their two strong points - providing light and heat - your plants will still need your help to meet their other needs. In fact, the high levels of light and heat often cause plants to use up nutrients and carbon dioxide at an accelerated rate, meaning you have to fertilize regularly and vent the greenhouse periodically to provide fresh air. The high temperatures also make water evaporate faster, so diligent watering is critical, especially for container plants. Taking care of these simple tasks will help your greenhouse plants to thrive.